For the past few years at the Emmys, it's almost felt like there's been too much good TV. That's especially clear in the 2014 Emmys' stacked Outstanding Lead Actress in a Comedy category. Lena Dunham, Edie Falco, Julia Louis-Dreyfus, Melissa McCarthy, Amy Poehler, and Taylor Schilling all turned in great and radically different work this year. Now that Orange is the New Black is eligible, obviously the more categories it wins, the better for us rabid fans. But while OITNB deserves a metric ton of awards show gold, the five other contenders are no less amazing than Schilling as Piper Chapman. 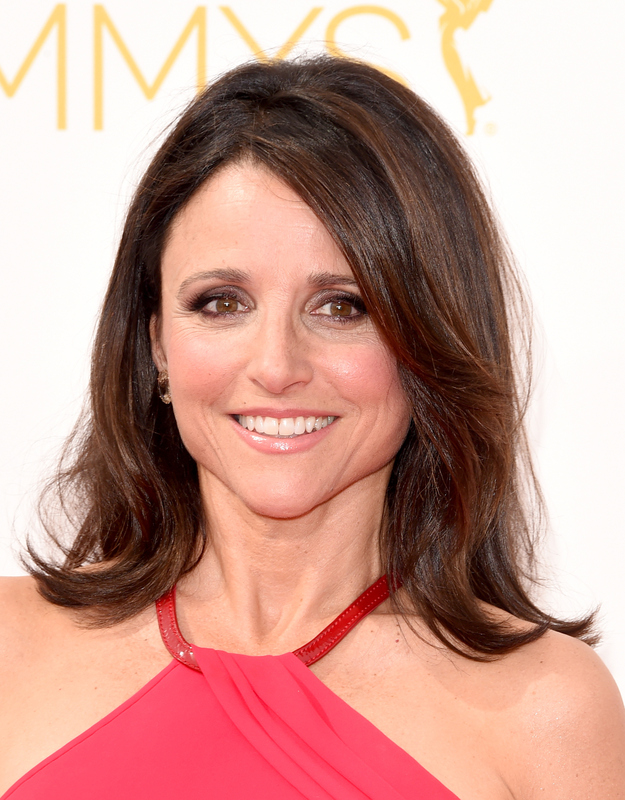 Turns out, it was a repeat of last year's awards, as the champion was Julia Louis-Dreyfus! Not that it was completely a lock. McCarthy is both the only A-list movie star and the only nominee on a three-camera show (CBS' Mike and Molly), which led voters to choose her once before. On Nurse Jackie, Falco fits into the weird pay cable niche of shows that aren't funny enough to be true comedies, but always have enough wit to be dramas, and she balances both tones perfectly. It's lit-rally unbelievable that Poehler's only won one Golden Globe for all of her work on Parks and Recreation. Louis-Dreyfus not only won once before, but is also nominated as a producer for Veep. And if we're awarding points for multitasking, Lena Dunham gets all of them for doing basically everything but the catering on Girls. Six great ladies, six even better performances. But Julia Louis-Dreyfus is the veteran of this category — she has four other Emmys for three different shows (Seinfeld, The New Adventures of Old Christine, and now three for Veep). But we, as viewers, truly were the big winners this year — last year, the rest of the Veep cast got in character, with Anna Chumlsky on her Blackberry in the audience and a nervous Tony Hale carrying the Emmy for her, while Louis-Dreyfus adopted Selina's bored, almost condescending cadence for the acceptance speech. This year, she managed to entertain us once again with an amazing sight gag. After presenting with Bryan Cranston and pretending she "forgot" his performance on Seinfeld as dentist Tim Whatley, he laid a cinematic kiss on her on her way to the stage to accept her Emmy. But she didn't rely only on jokes — Louis-Dreyfus got emotional during her acceptance speech: "I've worked in a lot of places in this town and [HBO} is absolutely my favorite place I've ever worked," she said. It takes a lot to make such a comedy pro to tear up a little, but the Veep cast and crew made it happen. Aww.